We talk about global warming, the rise of sea levels, air pollution, drought, floods, deforestation and more. Yes, it is true that the climate has changed in the past few decades. The climate is changing now, and may still continue to change in the future. However, there are things we can do to adapt, to slow down, to stop, or to even reverse any negative impacts. One man has worked for nine years and invested over 700,000 Chinese renminbi (RMB), or approximately US$100,000, to restore a large area of semi-arid land in the Khorchin district of northeastern China. And to do so, he chose to live in this harsh climate, where the annual temperature varies from between -36 to 45 degrees Celsius. This hero’s name is Wan Ping. Khorchin spans the Chinese provinces of Inner Mongolia, Jilin and Heilongjiang, covering 50,600 sq. km. In China, Khorchin is historically famous not only for its beautiful grassland landscapes but for its beautiful young ladies, including one of the empresses of the Qing Dynasty. 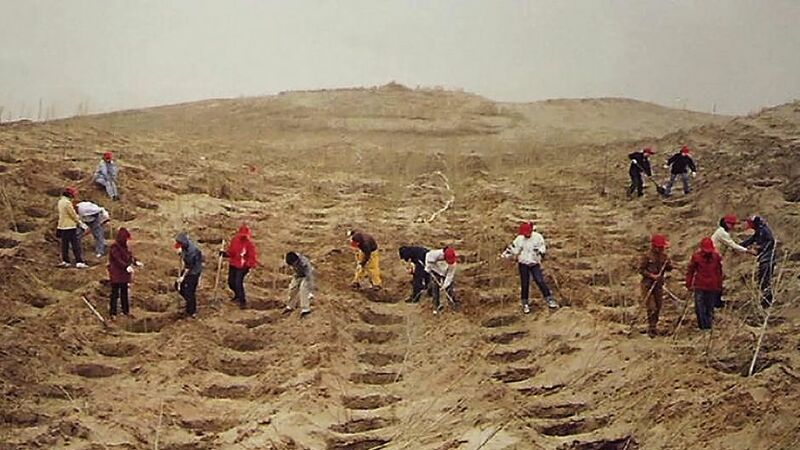 However, today the grassless areas are expanding quickly and becoming the biggest sandy area in China. A sandy (semi-arid) area is different from a desert because it is able to hold some underground water. However, here moving sand dunes are like monsters that can easily devour vegetation on the ground and even houses. Average annual wind speeds can reach 3.5 miles per second and the highest wind speed can reach more than 21.7 miles per second. Khorchin experiences a wind of level of 8 on China’s wind measurement scale (1 being a breeze and 12 being a tornado), for 45 days annually. In fact, most of the country’s sandstorms have begun in this area in recent years. People in Khorchin — who rely on food crops such as corn to sustain their livelihoods — face problems brought on by the severe environmental conditions, such as lack of water, insufficient farmland and transportation difficulties. This unfavourable natural environment leads to low incomes and pressure on children to drop out of school at a very young age, even as young as 10. These children follow in their parents’ footsteps, exploiting as much virgin land as possible, raising more livestock and wishing for a better life. However, as a result, they see more land become grassless, more sand storms, and a degraded environment. Further, unlike in China’s urban areas, local people tend to have more than one child per family, which places more pressure on the ecosystem. Of course this means they will be fined because of China’s “family planning” law that limits the number of children per family, and this will further aggravate their economic condition. Within Khorchin’s vicious cycle, their life has not yet changed, and neither has their children’s. However, on 16 June 2000, this area might have experienced a turning point. That day, former thermo-dynamics engineer Wan founded an ecological demonstration area near Xinhe village in Jilin Province. 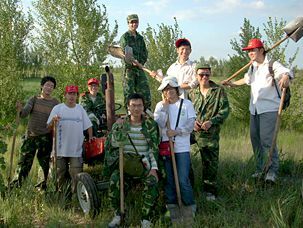 Wan’s project aims to restore the environment in Khorchin, and at the same time improve local people’s living standards. In 1999, Wan was at the peak of his career when he realized the crisis of climate change in Khorchin. Ten times on foot, he explored the 2,500 sq. km of sandy area located near the border of Inner Mongolia and Jilin provinces to examine the degradation of the grasslands and the local weather conditions. After that, he quit his job in the city of Changchun determined to try and make a difference. 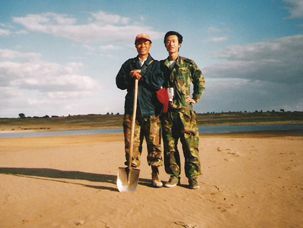 Wan started to plant trees in the demonstration area as the first step of his project because re-vegetation is the key part of land restoration. The baby trees must be watered frequently or they will die because moisture evaporates quickly in such an arid environment and there is not enough underground water to support them. In the heat of summer, people can get sunstroke, especially when doing hard labour. Wan fainted several times when he did his outdoor work. But no difficulties — such as local people’s misunderstanding, the cold shoulder of the government and even the lack of support from his family in the first few years — have stopped him from carrying out his passion. He was even attacked by local hunters who were against his plans to save the native wildlife (like foxes and rabbits) in the demonstration area. He may hesitate, he may wander, he may evaluate in his heart what he is doing, but he does not retreat from his mission. Because of his dedication, there is a luscious windbreak today, the moving dunes have been fixed, there is a 95% green coverage rate in the demonstration area and there is more precipitation. For projects like this to succeed, the local economy should also develop. In 2004, experts found that the local soil and weather conditions are suitable for growing grapes and that the income from growing one acre of grapes is equal to the income of growing 30 acres of food crops such as corn. 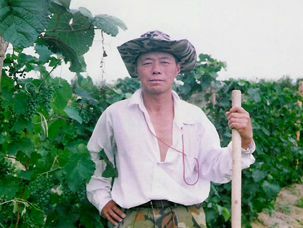 Wan began leading local farmers to plant grapes in the restored area, and in 2007, a local wine brewing corporation was launched. According to Wan, the grape planting did not go smoothly in the beginning, because those grapes did not sell well due to the lack of both growing experience and transportation problems. Actually, they were losing money, but in order to encourage villagers to continue growing grapes, Wan compensated them for their early economic loss. Now grapes have become the main source of income for some local people and by 2007, the annual per capita income of local farmers was RMB 2,000 (US$300) more than surrounding regions. This shows that development and environmental protection do not conflict with each other, but rather can be mutually beneficial. In China, my generation (born after 1980) is called “the 80th”. We are blamed by the generations of our parents, grandparents or even great grandparents for our idleness, our unbridled character, our lack of handwork, our selfishness, etc. We have not argued with that and we have believed that we really are. However, things are changing and now people have begun to call us the “eco-generation”. We are realizing that we are promising and that the world needs us. I went to Khorchin as a volunteer during the winter holidays in 2006. It happened to be the coldest days of the year, reaching -36 degrees Celsius at night. I lived in Wan’s house, the only building in the ecological demonstration area, and we ate mostly foods made from local pumpkins and potatoes. My job was to help Wan do home visits on foot to consult with local families about their children’s education. Wan knows that this recovery work cannot be done by one generation alone. So, in order to “plant trees in children’s hearts”, he became a volunteer teacher at the local primary school and since then, the drop out rate has decreased and no local children have quit school before the age of 13. We did this because there is no other outdoor work we can do during the winter. Between 9 a.m. to 3 p.m. daily we were able to visit only three children’s homes before we started to walk back, because there is no transportation in the sandy area. According to Wan’s records, a large number of people have come to help him over the nine years: from the first local people who came to share the labor, to 1,198 students from different Chinese universities, to international volunteers, including even an elderly couple from Japan. I am hoping that more and more people can join us, join the team of volunteers, not only in Khorchin but also in other areas where the environment needs us. One Man Inspiring Hope by Hope He is licensed under a Creative Commons Attribution-NonCommercial-ShareAlike 3.0 Unported License. Hope He (何皓) is an ordinary Chinese girl, born in 1989, who is now majoring in telecommunications at Harbin Institute of Technology in China. Hope plans to be an engineer after she completes her studies and, through her work, she really wants to make a positive difference to China’s environment.